Inside front cover ad is for Tim Burton’s Nightmare Before Christmas. The home of Jonathan Chambers, which may be more fortress than home. If he had his way, it will be a prison for mutants and a haven for mutants. There is some serious 90s art going on in this issue. I would think with the old school artists as inkers, it would be tamer but I guess they could only do so much. Explosions start happening and the Brotherhood of Evil Mutants are there – Toad, Pyro, Blob and an unknown blonde lady. Pryo calls her a babe and her name is, Phantazia – who time doesn’t remember her. These four fight the two mutants who are trying to invade the fortified home. Mr. Chambers puts a halt to the beat down, as he is hoping the two new mutants will become friends of his. He reveals their names as – Mr. Bohannon and Mr. Petros. Xavier’s School for Gifted Youngsters. Westchester, New York. 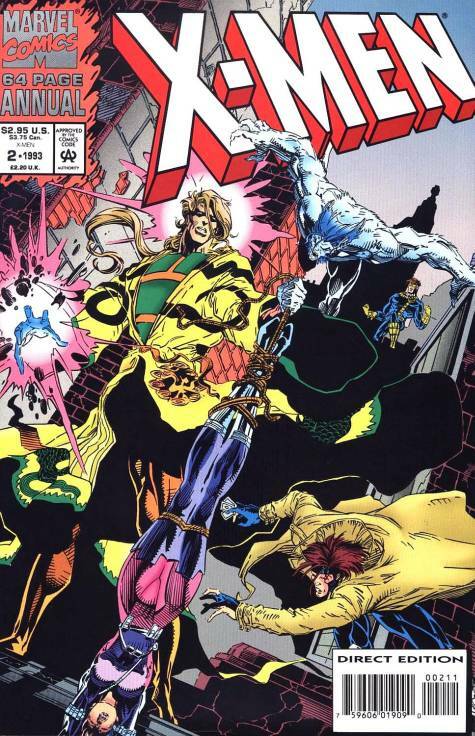 Moira MacTaggert, Banshee, Xavier and Beast are all discussing the Legacy Virus. Five additional mutants have died. Banshee reminds us that Stryfe is the one who unleashed the disease. Hank states that Magneto was right, there is nothing to do about all of the deaths. Which he cracks himself up, as he was trying to break up the mood. We get to the point of why I bought the issue. One couldn’t discuss the Legacy Virus without mentioning one of the first victims of the disease, Illyana Rasputin. Beast is new to the research for the cure, Xavier didn’t want to burden him with this responsibility. The Danger Room. Revanche (in British Psylocke’s body, but it doesn’t look like the body I remember), Jubilee, Rogue and Gambit are training. Psylocke (in Revanche’s body), Cyclops and Jean are watching from the control room. Jubilee is mostly in the way. Jean conforms that Psylocke and Revanche are not their full minds in the other’s body, they are half of themselves and Revanche. This, naturally, upsets Psylocke. Florida Keys. The Brotherhood are getting along okay with the two new guests. We get to learn their hosts, Chambers’ powers. He can take mutants powers and shut down their powers, it looks like he is spitting green vomit though, when he uses the power. Out on the river, Henry Gyrich is working with a Mr. Cleary, they are monitoring the situation as operatives in Operation : Wideawake. The X-men are on their way to meet with Chambers, they were invited. Beast really dug Chambers’ book, with the title “fatal Attractions” so that must be in the works. 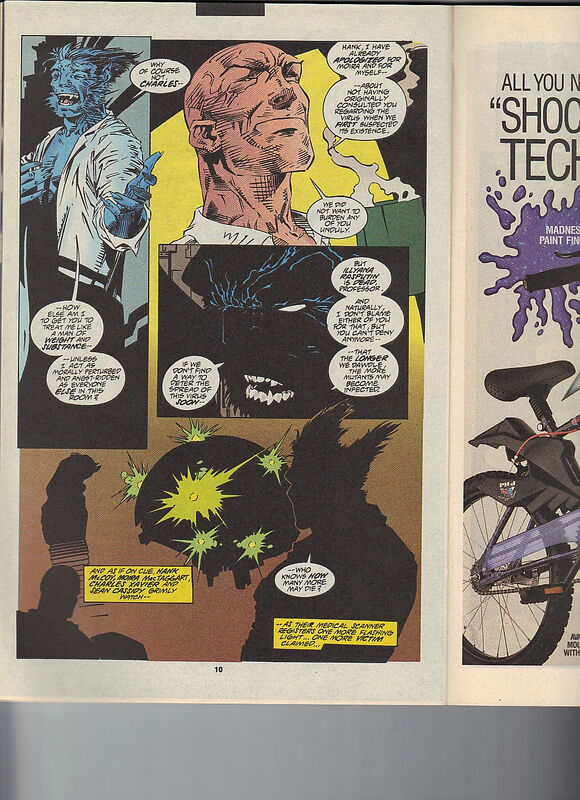 This annual and that crossover, both came out in 1993. Cyclops, Beast and Rogue get to go through the front door. The others have to check out the sub-levels. Henry Gyrich, with all of his mutant experience, knows that too many mutants in one room or place, there will be a fight. So he decides to sit back and let them knock each other out. A giant fight breaks out between the X-Men and the Brotherhood. Chambers shuts all of their powers down and calms them down, he will not have his work be undone. He wants his house to be a safe haven for those with the Legacy Virus, so they can die in peace. Pyro reveals it is him who is dying of the Legacy Virus, the others are there to make sure his last days are decent. Though he doesn’t die until Cable 87, in 2001 (eight years later from this moment, saving Senator Kelly’s life in the Dreams End crossover). Revanche stands with Pyro, as her newly adopted body is also dying of the Legacy Virus. Good thing Betsy got her body and has been rocking it for decades now. This story ends with Gyrich and the government coming to the house. Cyclops tells Gyrich that nothing is troubling there and everybody leaves. There is a ten page Beast story at the end, but it stars Beast (in nearly every panel) so I didn’t read it.